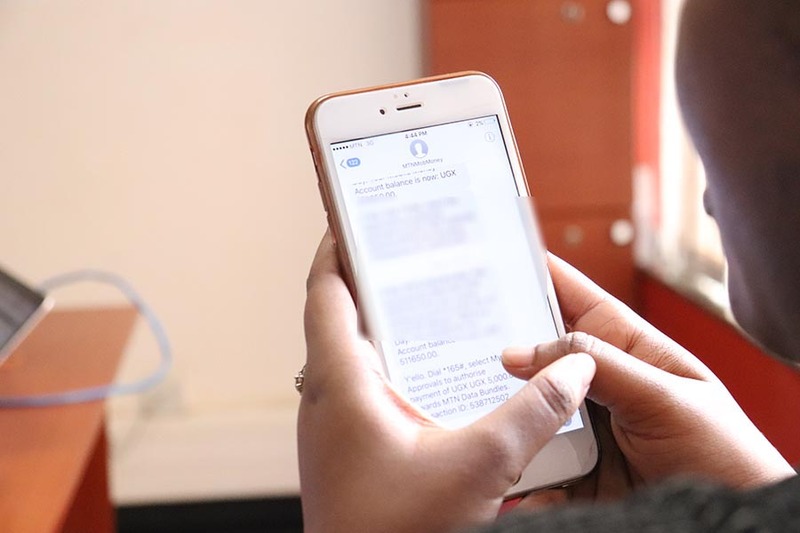 Over 57% of Ugandans are using Virtual Private Networks (VPNs) to access social media platforms while over 47% have shunned away from Mobile money transactions since July 1st, a new survey has revealed. 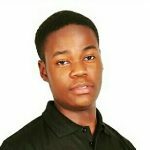 According to a survey carried out by Whitehead communications between 7pm on July 13th to 5pm on July 16th with a purpose of serving as a resource in a consultative and evidence – based review of social media and mobile money taxes, 96% of the respondents had used social media in the past six months. The figure however dropped to 85% when asked if they had accessed social media since the 1st of July. Of those that reported as using social media since the new tax became effective, 40% said they had paid the ‘Over the Top’ (OTT) tax while 57% were using VPN and 38% using Wi-Fi/Hotspots. 3% reportedly selected “other” and many used multiple methods to access social media platforms. On why the the figures are past 100% in the survey, Anne Whitehead told Nile Post that this is simply because of the fact that it was carried out using more than one method and this was a multi entry question. ” It is a multiple entry question, so people are using more than one method, which is why it doesn’t total 100%,” Anne Whitehead noted. Whitehead Communications is a firm that has mastered the art of providing value based public relations services with integrity, honesty and professionalism. 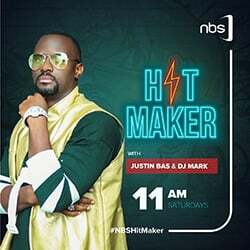 They work with various organizations and creative teams in Canada, Uganda and across the globe to build collaborations between people. Results of the survey were collected both online and through face-to-face interviews across the country, gathering 3015 raw responses and 2918 after data cleaning. 72% of the respondents were obtained in Central Uganda, 15% in Western Uganda, 8% in Northern Uganda and 5% in Eastern Uganda with 93 districts represented overall. 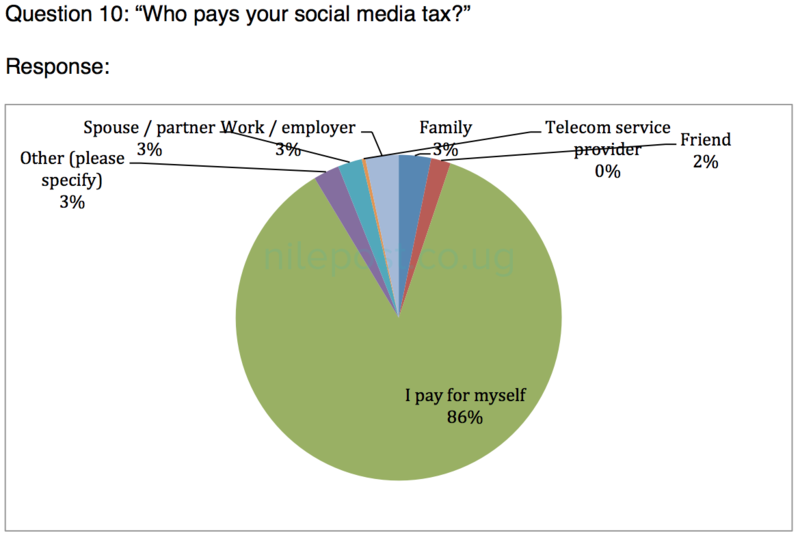 The survey included a lot of questions about the use of social media (OTTs) in Uganda and went ahead to indicate that of the 40% who are paying the tax, 86% paid for themselves, while 3% were paid by an employer, 3% by family, 3% by a spouse, 3% other and 2% paid for by a friend. 93% of the respondents reported that they had used Mobile Money in the last 6 months. 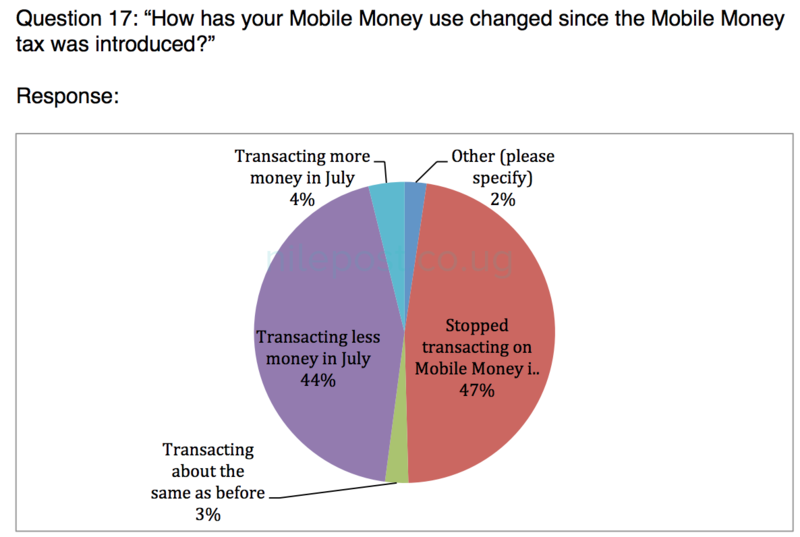 When asked how their Mobile money use had changed since implementation of the new tax, 47% reported they had completely stopped transacting Mobile Money after the implementation while 44% were transacting less money. 2% were transacting about the same as before while only 4% are transacting more in July. 36% of the Mobile Money agents respondents had also stopped transacting money this Money suggesting a significant impact on closure of these businesses. The over 2,334 respondents said the impact of the new Mobile money tax can be felt in their businesses pointing out delayed payments, general inconvenience, increased cost of doing business and reverting to bank and cash payments among others. Whitehead Communication’s survey went ahead to gather insights on the state of e-commerce in Uganda and asked respondents about the kinds of business done online. Agriculture, art, automotive sales, bakery, beauty products, clothing and shoe sales, consultancy, fashion, event promotion, photography,shopping, social media influencing among others topped the list. 8% of this sample was made up Mobile money agents amounting to 197 respondents. 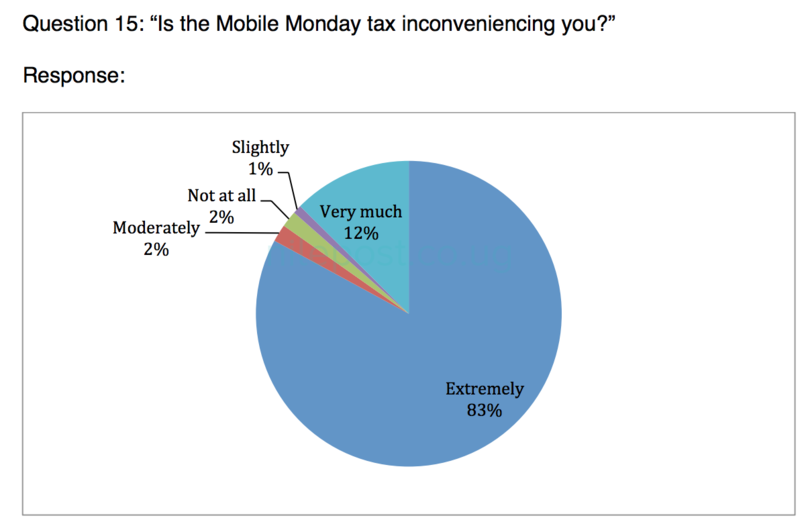 83% of the respondents said they were extremely inconvenienced with the Mobile money tax, 13% very much, 2 moderately, 1% slightly and 2% not at all. Many told Whitehead Communications that they use social media productively and when asked about the impact that the OTT tax has had on their livelihoods, over 1,640 people offered feedback saying this has now delayed conducting business,disrupted payments, general inconvenience, a smaller audience among others. 71% responded that they were extremely inconvenienced with the tax, 17% very much, 4% moderately, 2% slightly while 6% had no problem at all with it. The Cabinet however approved the amendment of the Excise Duty Act 2015 that will see mobile Money tax transactions reduced from 1% to 0.5% effected on withdrawals alone. Cabinet had however maintained the Over the Top OTT tax promising to only revise the payment. This could be good news for mobile money users as government confirmed a 0.5% tax to be effected on withdrawals alone. State Minister for Finance, David Bahati in an earlier address to the media this week noted that government has already collected close to Shs7b ever since they introduced the social media tax.